While the focal length range of this lens immediately raises the eyebrows of wildlife and sports photographers, this lens is not limited to those uses. While photographers pursuing other subjects may not immediately recognize the usefulness of a 150-600mm zoom lens, many will quickly realize the value of what they are holding after they have it in their hands. And they will likely be surprised by how frequently their lens is set to 600mm. The Sigma 150-600mm OS Sports Lens' eye-catching focal length range is complemented by a beautiful design, solid build quality and overall excellent functionality. Though rather large and heavy and though not inexpensive, the opportunities this lens gives the photographer definitely help justify the downsides. The first criterion for lens selection is usually the focal length range needed. Having the 150mm portion of the focal length spectrum covered is a great asset of this lens, but for those only needing the wider angle range of this lens' focal lengths, there are many other options available and some may be preferrable for one reason or another. When the focal length needs extend beyond 400mm, the options quickly narrow and the prices ascend rapidly for most of those remaining. 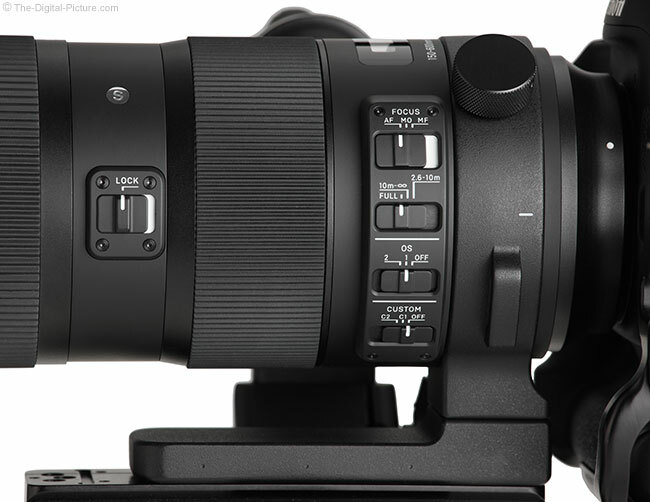 Until about 1 year prior to the Sigma 150-600 Sport lens' initial availability, there were exactly zero major brand name DSLR zoom lenses that included 600mm in their focal length range (aside from the huge $7,999.00 Sigma 300-800mm f/5.6 EX DG APO IF HSM Autofocus Lens). 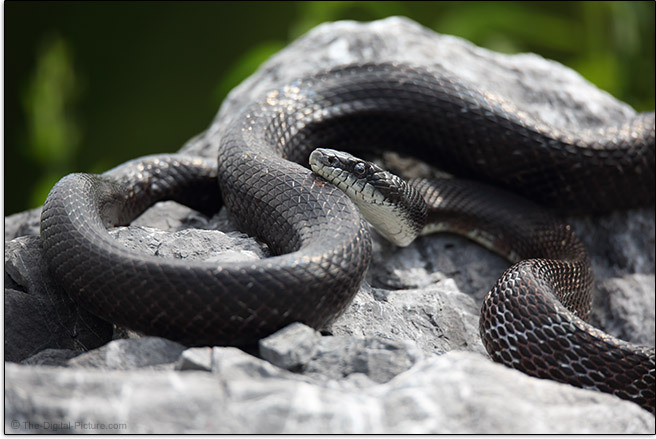 The Tamron 150-600mm f/5-6.3 Di VC USD Lens changed the landscape and quickly became a very popular lens. While I was not overly impressed with the greater-than-500mm image quality from this lens, what it delivered over the rest of its focal length range was quite impressive and especially impressive for its price point. The Sigma 150-600mm OS Sports Lens was the next to-600mm zoom lens to reach the streets and the Sigma 150-600mm f/5-6.3 DG OS HSM Contemporary Lens arrived soon after. Specifically in regard to focal length range, one 150-600mm lens has no advantage over another 150-600mm lens. Unless those numbers have been rounded significantly. Using an unscientific methodology involving relating the distance measurement to a properly-framed ISO 12233 enhanced resolution chart relative to the Canon and Nikon 600mm prime lens framing distances, I estimated that the Tamron option came within 95% of the 600mm figure or roughly 570mm. The Sigma's 600mm test chart framing measurement is slightly shorter than the Tamron's (31.43' vs. 32.23' / 9581mm vs. 9825mm), bringing the rough focal length estimate down to 556mm or so. However, the Sigma has less pincushion distortion at 600mm and this distortion difference could easily be the reason for any difference in the test chart framing distances between these two lenses. 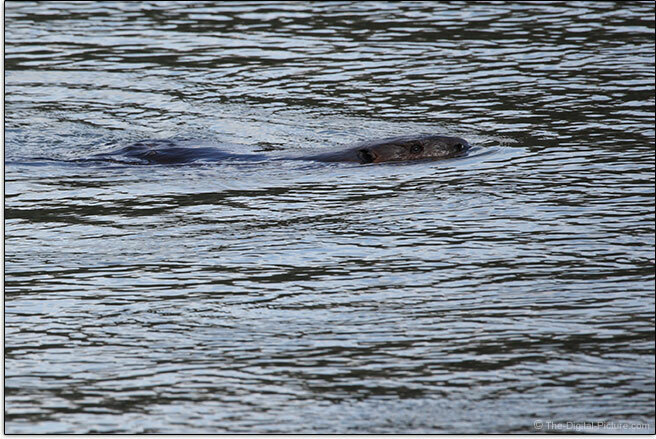 Suffice to say that the Sigma's 600mm is a very long focal length and it is sure to bring a smile to your face. 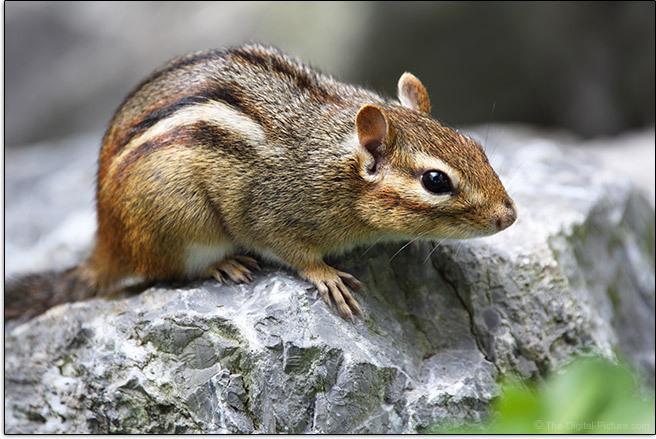 As implied by the opening sentence, there is a very good chance that wildlife and sports are your photographic pursuits if you are interested in the Sigma 150-600 Sports lens. While this lens has other very good uses, sports and wildlife frequently have subjects that are not more-closely approachable and longer focal lengths become a requirement instead of a luxury. As suggested by the lens' name, I used the 150-600mm Sports Lens for many spring sporting events I was covering in recent months. I was able to capture team award photos at 150mm and could capture distant track and field participants tightly framed as they crossed the finish line or jumped over their bars and hurdles while remaining far out of the way. I didn't make an effort to get credentialed for one tightly controlled event and from outside of the waist-high track perimeter fence, a 150-600mm lens (the Contemporary version in this case) allowed me to frame the participants tighter than any of the credentialed photographers could from inside the fence with the lenses they had. 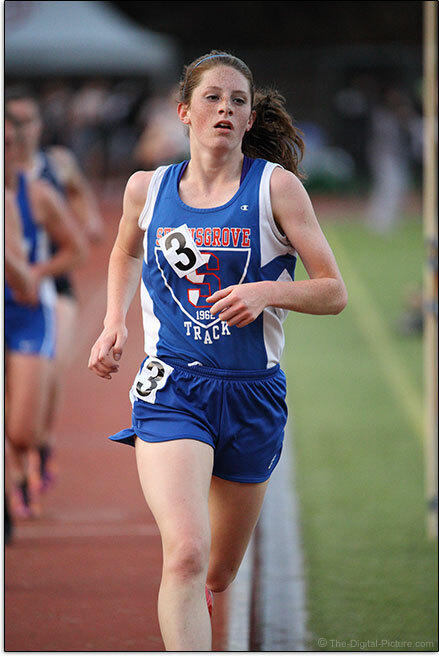 That is Brittany taking down her high school's sophomore class 3200m record. It was an exciting race that I was privileged to watch. My memory of that event will fade rapidly, but this image will not and every time I see it, my memory will be refreshed. That is priceless. From just behind the goal line with 150-600mm in my hands, I was able to cover half of a full sized soccer field using a full frame body. When the action approached, I could zoom out and with this wide zoom range, I often had my choice of camera orientations available. When using a prime lens, the distance to the subject often dictates the selection of camera orientation (to avoid cropping the subject too tightly). This focal length range permits ideal framing over a significant range of subject distances, requiring less image quality-detrimental and modestly time consuming cropping in post. Want close-ups of dangerous sporting activities? This lens may have your name on it. The discus throw is one such event I photographed with this lens. Shooting the thrower through the protective cage does not generate good imagery. Shooting this event within the landing zone is ... dangerous to both camera and photographer. With 600mm available, I was able to shoot tight images of the throwers without subjecting myself to potential impact damage. Bird photographers never have too much focal length and having a zoom range to work with means that even large and close birds and other wildlife can be framed environmentally, showing the landscape along with the animal. There are many other photographers who can make use of this wide 4x focal length range. Photojournalists with restricted access to their subjects, paparazzi and law enforcement groups will find this focal length range useful. Portraits, especially the tightly framed variety, are on this lens' capability list (though this is a heavy lens for portraiture). Landscapes are an additional subject included in this lens' capabilities. Long focal lengths are great for making colorful sky photos from even modestly nice sunrises and sunsets. Compressed mountain landscapes can be especially nice. Place an APS-C/1.6x FOVCF camera behind this lens and the angle of view becomes equivalent to a 35mm 240-960mm lens. Those extremely narrow angles of view move this lens' uses more deeply into the sports and wildlife range. Framing small and distant subjects large in the frame is (relatively) easy at 960mm, but help steadying the camera will be appreciated for good composition. While long focal lengths will make you want to photograph very distant subjects, under some situations, too-distant subjects should be avoided. 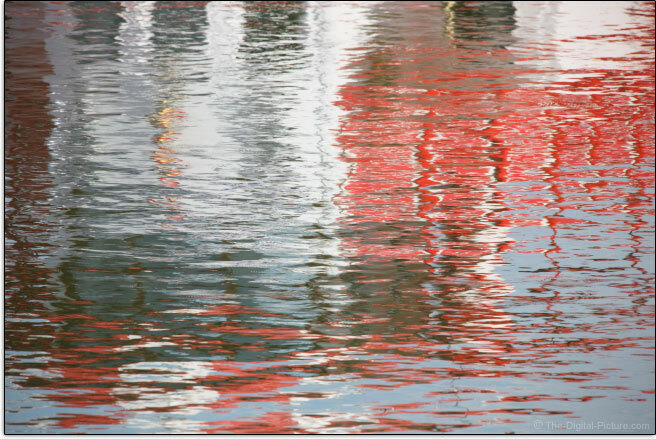 Haze can reduce contrast and heat waves/shimmer can quickly destroy image sharpness by micro-distorting details. While haze is primarily limited to affecting long distance photography, heat waves can affect even close range photography. While testing this lens at 600mm on a sunny afternoon, the focal length magnification made heat wave distortion easy to see over thick green grass at only a roughly 100' (30m) subject distance. Shooting subjects on a track (the kind that people run on and the kind that people drive on) frequently results in heat wave distortion affecting the final image. Artificial turf also generates lots of heat wave distortion on a sunny afternoon. The tip here is that using the long focal lengths to photograph distant subjects must be done with consideration to the effects of heat waves and haze. Or phrased another way, the sharpness of the lens may not matter if your subjects are distant and a heat source and/or haze is present. 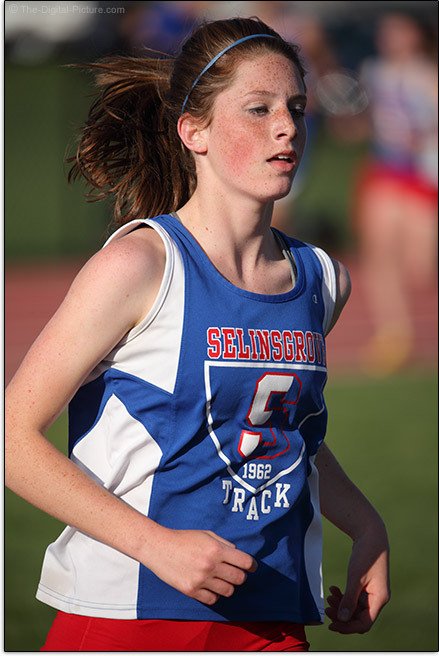 Note that heat waves can negatively impact AF performance as well. Another occassional downside of being farther away is that obstructions can come between the photographer and the subject. Sometimes, focal length-limited photographers competing for the same image are the problem. Sometimes, it may simply be trees that get in the way. Want very long focal lengths in a zoom lens without a large size, heavy weight and high price? You are likely looking at a variable max aperture lens. Like the majority of zoom lenses with focal lengths reaching over 200mm, the Sigma 150-600mm f/5-6.3 OS Lens is such. A variable max aperture means that wide open aperture exposure settings will change as the lens is zoomed from 150mm to longer focal lengths. Cameras in auto exposure mode will automatically account for the narrowing max aperture change, but manual mode requires a manual exposure adjustment when using wide open apertures (unless auto ISO is being used or an in-camera function accommodates the changes). Stepping down to a max f/5.6 aperture only 35mm into the 450mm overall focal length range and to f/6.3 only 136mm later places this lens near the slowest/darkest in terms of max aperture (and viewfinder brightness). But, the difference is never more than 1/3 stop between this lens and the other zoom lenses reaching farther than 400mm. That difference will not likely be a decision factor for most. Being realistic, the Sigma 150-600mm, even with "Sports" in its name, is not going to be your best option for capturing low light action. When the sun sets or the clouds roll in, you will be reaching for noisy-high ISO settings to get a 1/1000 to 1/1600 shutter speed at f/6.3. For the track sample photo shared just above, I was using ISO 6400 to get a marginal 1/1000 sec shutter speed immediately after sunset on a clear day. Don't underestimate the shutter speed required to stop motion at 600mm. An in-action subject that was photographed at 300mm will need a significantly faster (figure 2x) exposure duration when photographed at the same distance (same subject framing) at 600mm due to the subject crossing twice as many pixels in the same time period. Because reaching for higher ISO settings when shooting fast action is frequently necessary, the narrow aperture may be the biggest detriment to final image quality when using this lens in comparison to a wider aperture prime lens option. As mentioned, wider apertures greatly increase the size, weight and price of the lens, so as with most products, there has been a tradeoff made. Not willing to compromise your aperture, but still want the zoom range? 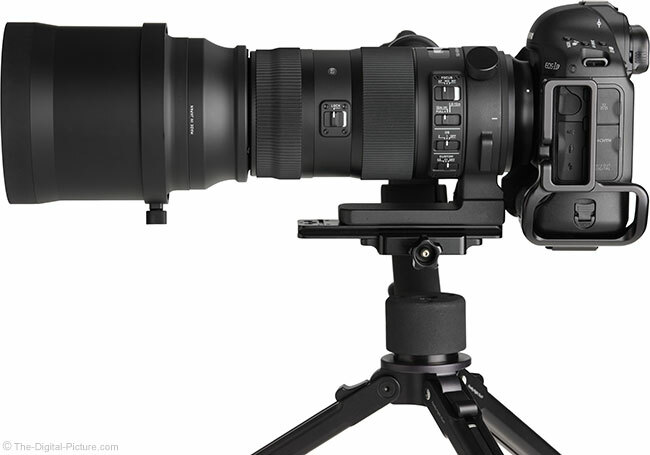 Perhaps the "Green Giant", the Sigma 200-500mm f/2.8 EX DG IF Power Zoom Lens, has your name on it. With the sharpness-reducing effects of diffraction kicking in with some strength at f/11 through f/16 (depending on the DSLR being used), there is a somewhat narrow range of ideal apertures available for optimal use in this lens. Fortunately, those remaining apertures are quite useful. Optical stabilization can greatly increase the versatility of most lenses, and when the focal length increases to 600mm, especially on an APS-C body, OS can save the day by virtue of the stabilized viewfinder alone. Framing a subject properly at 600mm handheld requires steady arms, but OS reduces the steadiness requirement to include a much greater population. Sigma has not published the optical stabilization system rating for this lens, but I would be surprised to learn of a less-than-four-stop rating being introduced today. With good form and stable footing, I could get mostly-sharp handheld results down to 1/13 second at 150mm and at 1/10 second exposures, I was still seeing a healthy percentage of sharp images. These numbers represent approximately 3 2/3 to 4 stops of assistance for me. The keeper rate slowly declines as exposure durations are increased until about .4 seconds. Beyond .4 seconds, nothing was worth keeping. Getting even 1 keeper at .4 second 150mm exposures is remarkable. Longer focal lengths with their greater magnification require faster shutter speeds to deliver sharp handheld results than their wider angle counterparts do. At 600mm, the 150-600 gives me mostly sharp handheld results down to 1/50 seconds for again, about 3 2/3 stops of assistance. Keeper percentages were low with exposures longer than 1/40, but persistence can make a longer exposure work. 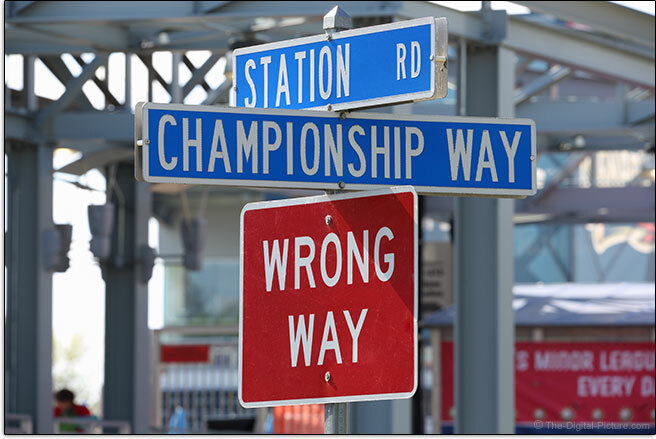 Standard – This is the default setting. The OS effect is well-balanced and suitable for various scenes. The lens comes with "Standard" selected by default. I primarily used Standard mode for my testing (and off while shooting sports), but I prefer Dynamic View Mode for subjects that are not moving quickly. Some clicks are heard at OS startup and shutdown, but the operational hum is very faint. There is sometimes a small amount of jumping seen at OS startup and shutdown and subject framing drifts a small amount during OS operation. The end results from this lens' stabilizer are quite good. A zoom lens advertised as reaching 600mm while having a wide range of additional focal lengths immediately raises my skepticism in regards to image quality. If the Tamron 150-600 hadn't paved the way, my expectations from this lens would have been considerably lower. Having already evaluated Sigma's first Sports lens, the Sigma 120-300mm f/2.8 DG OS HSM Sports Lens, with a positive outcome also increased expectations. The price of this lens also reflected Sigma's confidence that it would perform. The first hurdle to determining this lens' image quality was to actually get the lens in my hands. Sigma claimed that very high worldwide demand was the cause for this lens being unavailable, not showing in retailer stock until over 5 months after first being available. It was many months until I had the first sample on my desk and unfortunately, that lens became the second hurdle. That lens apparently had a misalignment problem that rendered the left side of the image sharper than the right as illustrated below. Another month or two passed until I could get two additional lenses to test. One of these lenses was provided by Sigma USA (a loan) and the second test lens was the result of a retail preorder finally being fulfilled. Most people consider image sharpness, a combination of contrast and resolution, to be the most important lens image quality attribute. Based on two samples testing similarly, you can expect good sharpness from the Sigma 150-600 Sports lens across the entire full frame sensor with a wide open aperture. Stopping down to f/8 only generates a slight sharpness improvement. This lens performs remarkably consistently over the entire focal length range. Though the Sigma-supplied lens (sample "1" in the image quality tool) is slightly soft on the right side at 300mm with a wide open aperture (the left side looks great) and the retail lens is also slightly softer at 300mm, the balance of the focal length results are similar within and across lenses. Note that the second good lens was used for the 7D II test results in the Image Quality tool. While I'm not going too contend that this lens competes at the level of the most-elite zoom lenses available today in terms of sharpness, it does perform reasonably well. It performs especially well for having such a wide range of very long focal lengths. I'll add many comparisons in the alternate lens section at the end of this review. There is of course more to image quality than sharpness. Full frame camera owners will see close to or just over 2 stops of vignetting in image corners when using this lens with a wide open aperture. This amount is moderately noticeable. Wide open corner shading variation over the focal length range is quite low. When a variable max aperture lens is stopped down to a specific aperture, such as the f/8, the wide focal lengths enjoy more stops of stop-down and thus, also enjoy diminished vignetting. Stopping this lens down to f/8 produces corner shading that ranges from about .6 or .8 stops isolated to deep in the corners at 150mm up to a more-evenly-distributed about-1.4 stops at 600mm. A still potentially slightly noticeable 1 stop of shading remains in 600mm f/11 corners. APS-C format body owners will not likely notice vignetting when using this lens, regardless of aperture setting. Expect to see a modest amount of CA (Chromatic Aberration) in the mid and peripheral image circle at the wide end of the focal length range. The CA diminishes to negligible in the mid lengths (around 400mm), but becomes modestly noticeable again as 600mm is reached. For the uses I've had for this lens, I seldom encountered the effects of CA. 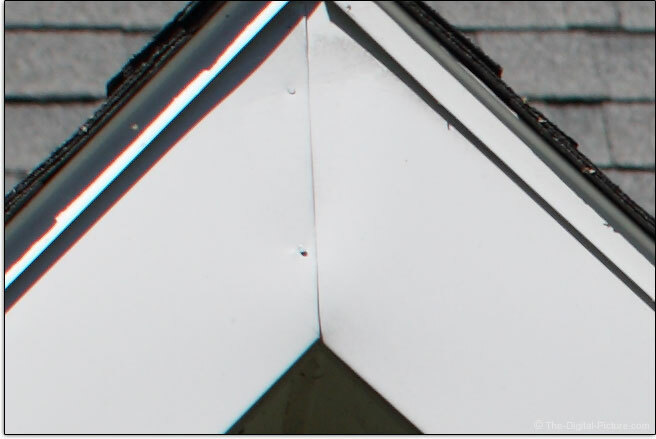 For the worst case 150mm full frame corner example shown below, I intentionally went looking for strongly contrasting lines running tangential to the image circle. It is a telephoto lens with long focal lengths and a large element count, so one should expect to see some flaring if a very strong light source enters the picture (such as the sun). For safety reasons (my own and the camera's), I did not perform standardized flare tests on this lens beyond 400mm. The amount of flaring seen in this range was not unusual. The 150-600 Sports lens has a slight amount of pincushion distortion that is very consistent over the entire focal length range. The least amount of distortion is at 600mm, but the difference between this focal length and the rest is small. This lens performs very well against other zoom lenses in this regard. Lenses with extreme focal lengths or an extreme range of focal lengths often show shortcomings in their image quality. While this lens is not the ultimate performer in this regard, it is quite good and impressive for what it provides otherwise. Driven by Sigma's HSM (Hypersonic Motor), the Sigma 150-600mm OS Sports Lens focuses with reasonable speed out of the box. 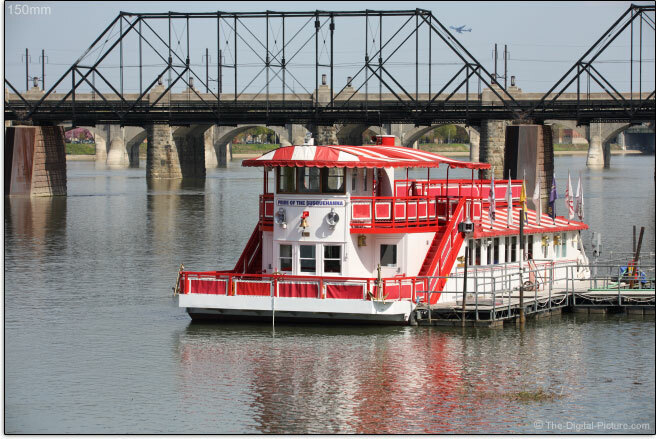 I say "out of the box" because the focus speed performance attribute can be configured using the Sigma Dock. Basically, the slower (Sigma references "smoother" instead) the lens focuses, the greater the chance that the lens focuses accurately. The default "Standard" option provides a balance of speed and accuracy. By configuring one of this lens' two custom modes (switch selectable), faster (Motor's drive speed-priority) and slower (Focus accuracy-priority) focus drive speeds can be selected. You may find the slower speed to be the better low light option while the faster speed may prove great for your high contrast in-action subjects under bright light. Place clearly delineated subject with good contrast on a focus point and this lens focuses with decent speed in "Standard" mode and moderately fast in "Motor's drive speed-priority". The Standard mode has proven fast enough for most uses I have had. As much as I love fast-focusing lenses, focus accuracy is always more important. I gave this lens a serious AF accuracy workout to insure that it was functioning up to my expectations and could be trusted. I walked away happy. One shot AF is very consistently accurate and AI Servo results were quite good. A lens with these apertures does not require as much precision as a 400mm f/2.8 lens for example, but overall, I was pleased with the in-focus hit rate of my results. There were not many images that I tossed on account of mis-focusing. This image was the 8th frame into a 12 frame burst. The AF point (indicated by the white "X") was properly placed on the subject throughout the entire burst. 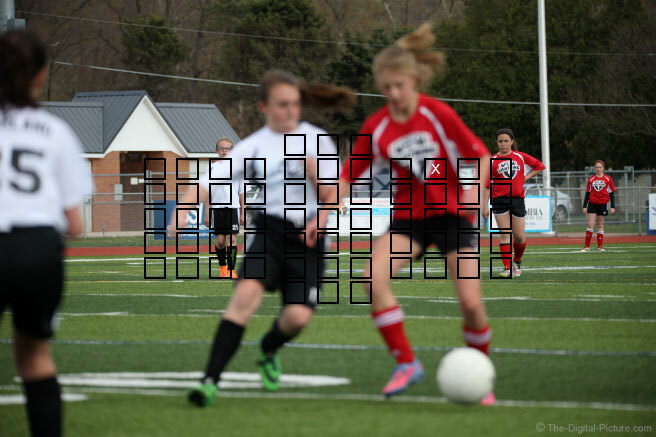 Every frame is completely blurred and no AF points indicate being active in DPP's Quick View (shown). This happened four times during this game and at that point, I switch to the center AF point with no further problems encountered. There were a handful of instances where I could hear the 1D X skip frames in a burst due to failure to maintain locked focus. The subject was a person running and the missed frames caught my attention as not being normal. Using the faster focus setting might have resolved this problem. By reducing the focus distance range the lens has to hunt through to find the correct focus distance (this lens does hunt on occasion), this lens can potentially lock focus faster. The focus limiter switch is designed for this purpose. Select between 32.8'(10m) - ∞, 8.5'- 32.8'(2.6m - 10m) and the full range of focus distances. Don't like any of those options? The dock can be used to create your own focus limit ranges, selectable using the custom mode switch on the lens. 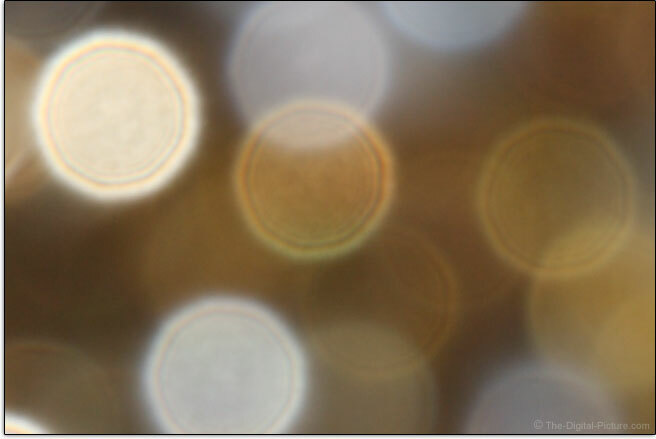 Focus calibration issues can cause mis-focusing, which can strongly impact image quality. I did not have focus calibration issues with this lens, but if encountered with your lens and camera combo, the dock can be used to correct this problem. With dock compatibility, consistent front or back focus issues can be corrected in the lens at 4 focus distances for 4 focal lengths (150mm, 250mm, 400mm, 600mm). The Sigma 150-600mm Sports Lens focuses quietly (unlikely to scare off your wildlife) with the typical shuffling of lens groups being just-audible in a very quiet environment. This lens focuses internally and FTM (Full Time Manual) focusing is available. The front element does not rotate with focusing. This lens is very close to being parfocal. With Live View at 10x, focus acquired at 600mm remains nearly ideal while zooming out all the way to 150mm. Videographers especially appreciate parfocalness in a lens, and they will also appreciate the lack of focus breathing this lens shows. Subjects come into and go out of focus very smoothly and stably with little or no change in their apparent size. The 150-600mm Sports Lens' focus ring is very nicely-sized, very smooth and well-damped with just the right amount of torque required to affect change. The 126° of rotation is great for precise focusing at the wide end, but rather fast for 600mm adjustments. An advantage of a fast rate of focus change is that fast moving subjects are easier to track (but doing so requires skill). A considerable number of focus distances are marked in ft and m inside the focus distance window. As clued by the focus limiter switch settings, this lens has a 102.4" (2600mm) minimum focus distance (MFD). At 600mm, this distance provides a moderate 0.20x maximum magnification (MM). Our MFD test showed that we could manually focus this lens down to about 90% of the rated MFD. With three different 150-600mm lenses coming through the lab as of review time, one might get the impression that lenses of this focal length range must have the same MM. 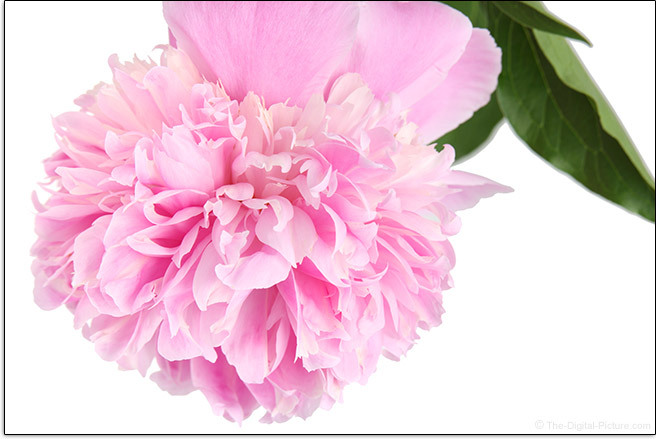 The following image features a 4" (102mm) peony flower captured at 600mm and MFD, illustrating what the 160-600mm Sports Lens' 0.20x MM capabilities. For a modestly shorter MFD (but loss of infinity focusing) and a correspondingly higher MM, use extension tubes. For a more significant magnification at any focus distance with no change in MFD, mount a Sigma Global Vision Teleconverter behind this lens. The addition of a Sigma TC-1401 1.4x Teleconverter creates a full frame 210-840mm f/7.1-f/9.0 OS lens. Magnifying the image by 1.4x does not go unnoticed in the image quality, but stop down to f/11 and the 840mm results are similar to the bare lens at 600mm f/6.3. The 1.4x increases CA modestly and also increases barrel distortion slightly. The latter is actually a positive change as it reduces the native pincushion distortion. Only cameras with f/8 max aperture-capable AF systems (including the Canon 1-Series, 5D III, 7D II) can autofocus the w/1.4x combination and only the center AF point is available. Focusing remains quick, but focus hunting becomes more common. 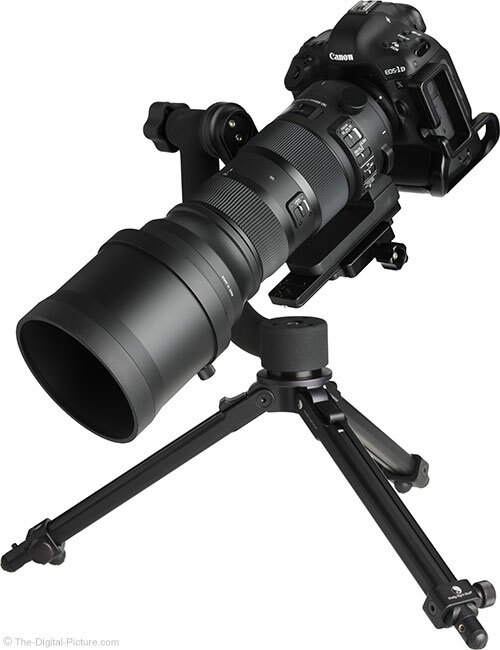 Use the Sigma TC-2001 2x Teleconverter to create a 300-1200mm f/10.0-13.0 OS Lens. While the focal length range on this combo looks amazing, the resulting image quality is not likely to impress you. Stopped down 2/3 of a stop to f/16, you might find the results sharp enough to be usable though diffraction is also impacting image sharpness at this point. CA is again increased slightly and distortion remains similar to the with-1.4x results. With an f/10 max aperture, this combo will not autofocus on any DSLRs using conventional phase detection AF and the viewfinder becomes very dark. Use the image quality and distortion tools to clearly see the results of the with-extender combinations with your own eyes (links provided at the top of this review). Very. Impressively. Built. The 150-600mm Sports lens feels like military grade hardware. This feel is aided by a significant size and weight, but this lens is a very well-constructed, pro-grade, weather-sealed lens. With surfaces of differing matte-ness of black, the 150-600mm Sports lens looks at least as good as it feels and functions. Most of the very large lenses available today do not extend, thus the site's standard large lens images do not maximize the views of extending lenses. This lens, reaching a long 18.9" (479mm) at the full 3.62" (91.9mm) extension with the hood installed, is too large to be contained within the site's smaller format lens product images. Because it is interesting to make comparisons between this lens and the smaller lenses, the 150-600 Sports is included in both of the site's product image comparison tools. That some of this lens' images are cropped in the smaller lens format sample set is expected, but the inclusion is still worthwhile from my perspective. This lens has no play in any parts. Both crisply-ribbed, substantially sized rubber rings are very smooth with firm (ideal) rotational resistance. The zoom ring, located toward the front of the lens, has a noticeable change in diameter starting mid-way into it, providing a tactile method of locating this ring. This ring's 126° of rotation provides a nice rate of transition between focal lengths. The zoom ring rotates in the Canon-standard direction (opposite of the Nikon standard). Prefer a push/pull functioning zoom lens over the rotational design? This lens has you covered. While some twist-zoom lenses can be extended and retracted by pushing and pulling their objective ends, Sigma makes this option official by providing a groove toward the end of the lens to facilitate easy push/pull zooming. Both methods have advantages and disadvantages, and your zoom method can be instantly changed at any time. The end of this lens is heavy, so it is no surprise that the end of the lens moving in the direction that gravity is pulling makes the zoom ring easier to turn with the opposite also being true. Gravity zooming is a bit of an issue with this lens. If the lens is pointed downward, you will quickly find it at full extension. For example, if you are shooting at a focal length less than 600mm and then direct the lens downward to rest your arms, to review your images on the LCD or for some other reason, the lens will extend fully to 600mm. The desired focal length must be re-established to continue shooting the same subject. Shooting upward at a hard angle? Plan on needing to hold the zoom ring in place to retain your selected focal length. Otherwise, the lens will self-retract. This problem is not unique to this lens, but this lens exhibits stronger gravity zoom attribute than most. Sigma's solution to this issue is a zoom lock switch. As with most lenses having a zoom lock switch, this lens will not extend even with pressure applied when locked at the widest angle focal length. Unlike most lenses, the 150-600mm Sports Lens can be locked at any marked focal length. While the lens cannot be locked at any of the in-between focal lengths, the marked focal lengths will lock in place until a modest pressure is applied to the zoom ring or the end of the lens (or the switch is moved to the unlocked position). The lock will not support a camera resting on top of the lens when sitting upright – the lens will retract in that situation. The lock switch along with a host of other switches can be seen in the image below. Aside from the lock switch, 3-position switches are standard. It is easy to misposition a short-throw 3-position switch such as these, but Sigma has done a nice job with the solid clicks these firm switches provide. Very nice is the white backgrounds on two of the switches, visually indicating set positions. I'll talk about the Custom switch under the dock subheading below. This is a big and heavy lens. It can be handheld, but it is most comfortably used with support. Here is a comparison chart to put everything in perspective. For many more comparisons, review the complete Sigma 150-600mm OS Sports Lens Specifications using the site's Lens Spec tool. All of these lenses extend significantly and the addition of their hoods significantly increases their overall size. Use the site's tools to make specific comparisons. The Sigma 150-600mm Sports Lens' included LH1164-01 Hood is beautifully sculpted, and more importantly, very well constructed. This thumbscrew-attached metal hood provides great protection to the lens itself. The flat end of the hood permits the lens to be placed upright on a smooth surface and the rubberized surface on the end of the hood prevents scratching of the hood or the surface the lens is sitting on. The rubberized hood end also permits a more-sure grasp on the hood when installing or removing it and helps prevent the lens from sliding on its resting surface. Sitting the lens upright is nice for relieving your arms while shooting handheld. The mount end of the hood is reinforced for lock-down strength. Even the locking thumbscrew feels finely crafted and operates very smoothly, locking the hood so tightly in place that it feels like part of the lens. Have any 105mm threaded filters in your kit? That answer is probably "No." That filters can be used on this lens and that they do not rotate are positive attributes. That filters of this size are uncommon, very large and expensive are downsides. My largest filters are 95mm, so I was unable to take advantage of this lens' threads. 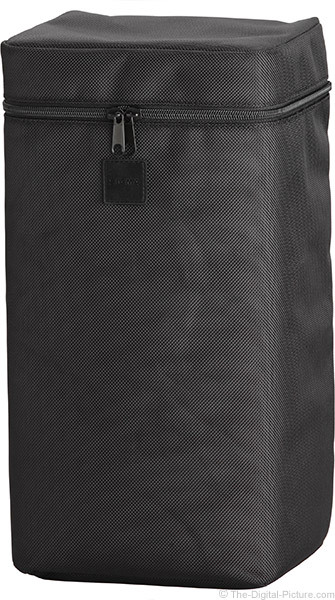 The Sigma 150-600mm Sports Lens ships with a nice zippered, padded nylon case with a shoulder strap permanently attached to a side. 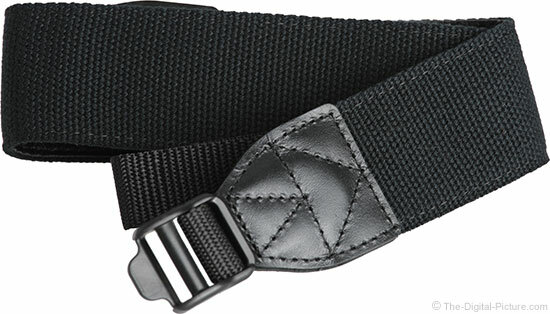 A single-side-attached strap rests against the body better than a strap attached to opposite sides. I would find this case even more functional with a few additional inches of length added to allow a mounted DSLR to fit inside. Perhaps a foam spacer could be included for when not carrying the camera. 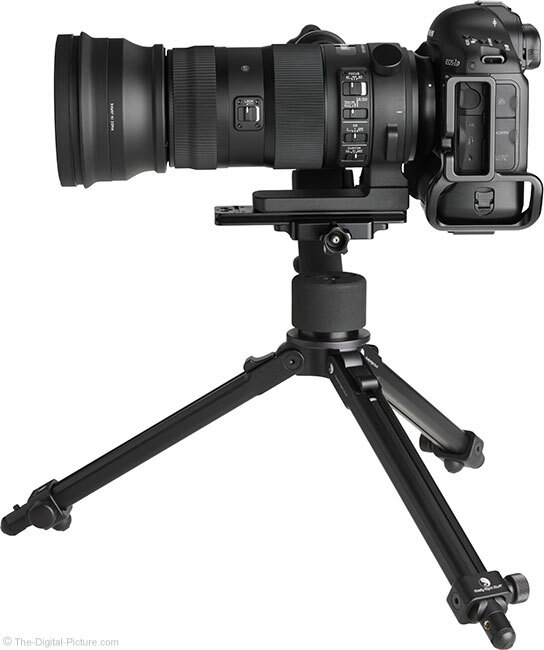 The Sigma 150-600mm Sports lens tripod ring is included and is not removable. Because of its importance for this lens and because of how well-constructed it is, this tripod ring gets a subheading of its own in this review. 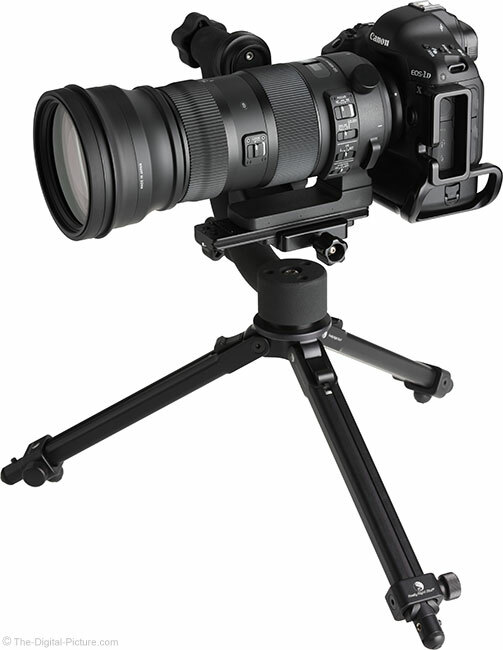 This is a heavy lens and it will be most comfortable to use used when resting on a tripod or monopod. That means that the tripod ring will be an important component in the use of this lens and I'm happy to say that this one is very solid and very smooth. The substantial tripod foot has three 1/4" threaded insert attachment points. If directly mounting this lens to a tripod or monopod, the choice of insert to use can be made for best balance of the lens. Because this lens is heavy and because it extends significantly, the balance changes noticeably over the zoom range – enough that the center of the composition will become lower as the lens is extended to the longest focal lengths even when mounted to solid tripod and head combinations. The balance also changes significantly with inclination or declination. What I personally like about having three inserts is that I can use the largest Wimberley Lens Plate available, the P50. The three attachment points provide a secure, no-twist mounting of the plate and the long plate gives me a fast adjustment of balance over the full length of the plate. The large plate was just enough for me to balance the lens over the tripod head when I was photographing the flower close-up picture (shared above) at a modest downward angle. A low profile foot is helpful in keeping the center of gravity low, which improves balance of the lens. However, the very low profile foot in this case is detrimental to how I use this lens. I generally carry big lenses by their tripod feet and carry medium-sized lenses by lens plates extending well beyond their feet lengths. This foot is long enough that the lens plate is not an advantage for carrying and the shallow depth of the 150-600 Sports tripod foot means that my medium-sized fingers are a very tight fit. Tight enough that it is uncomfortable and tight enough that the raised switch bank and my fingers do not fit at the same time. Tight enough that adjusting focus manually is also somewhat limited. The tight finger fit was also a modest issue for me because of how I control a monopod-mounted lens using my left hand on the tripod foot. The tripod ring is not removable, but the tripod foot is. You can remove it to use the lens without a foot, or the foot can be replaced with the optional TS-81 tripod foot as shown below. Not only does the TS-81 provide a very long built-in Arca-Swiss standard lens plate, but it also has a higher profile that permits better grip for fingers – it looks like a great lens upgrade to me. The tripod ring lock knob is conveniently positioned for use and locks smoothly with no slip-stick behavior right up until fully tightened. Detents are provided at 90° rotation settings with marks visually indicating the same. The tripod collar has a pair of attachment points for mounting the included neck strap. Ideally positioned, these attachment points allow the camera to be freely rotated without the strap strangling your neck. Note that the tripod ring on this lens is nicely improved over the 120-300mm Sports lens tripod ring. That lens' slightly sharp clamping mechanism is no longer used. Sigma's Global Vision lenses get a classification of "A", "C" or "S", representing a primary Sigma-intended designation of "Artistic", "Contemporary" and "Sports". A full description of these categories can be found in the Sigma 35mm f/1.4 Art Lens press release. I've likely overstated my opinion, but I am not a fan of the rather narrow categorization structure. As a Global Vision lens, this lens gets an "S" stamped in a classy chrome circle on the lens barrel. "S" of course means "Sports". While this lens is a great option for sports photography, it is at least as well-suited for wildlife photography, so ... perhaps there should also be a "W" embossed on the lens. This lens also gets an "A" for build quality and, artistic images are well within the reach of this lens. By dictionary definition, I'd classify this lens as "Contemporary" also. Regardless, I am really liking what Sigma is doing with the Global Vision lines. Just don't limit the lens' use to their letter designation. The second row of options illustrates what is available for programming into the C1 and C2 Custom switches. These settings become immediately available at the throw of a switch. I currently have Custom switch 1 programmed to "Motor's drive speed priority" and "Dynamic View Mode". The price of a pro-grade lens is typically a hurdle to get over. This lens wears a heavy price tag, but ... the price is not necessarily high in relation to the other lenses available. Some of Canon and Nikon's pro-grade telephoto zoom lenses with significantly shorter upper-end focal lengths are priced similarly. 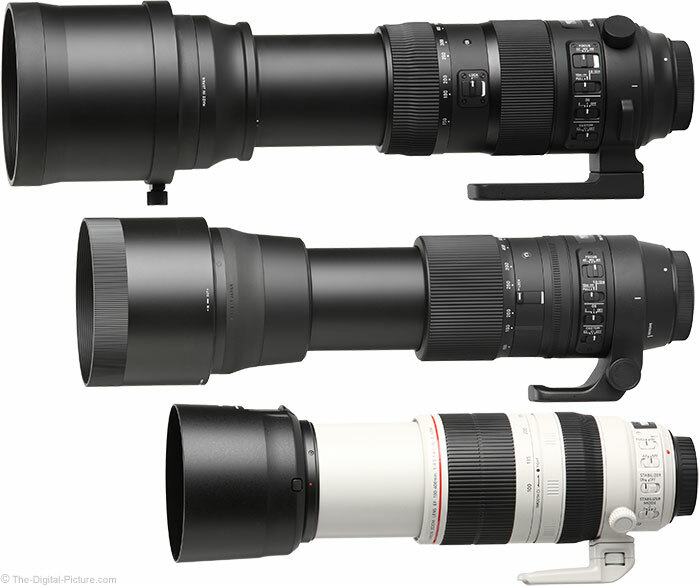 Canon and Nikon's 500 and 600mm lens options are multiple times higher. Coming from the other end, Sigma and Tamron both offer lenses with the same focal length range at just over half of the price of this lens. An in-the-field failure of one of these lower-priced lenses may leave you regretting the decision to save money up front. 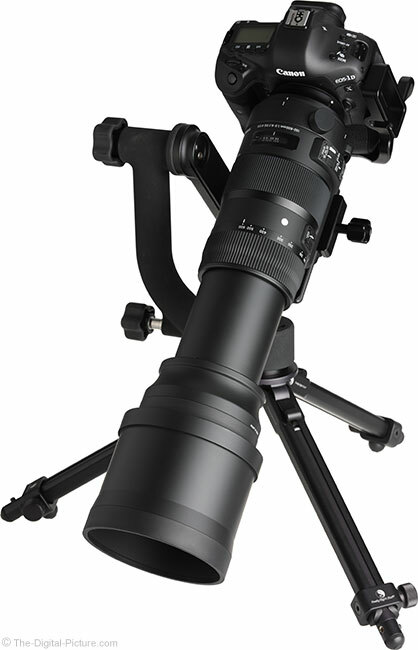 The Sigma 150-600mm OS Sports Lens is available in Canon (reviewed), Nikon and Sigma mounts. 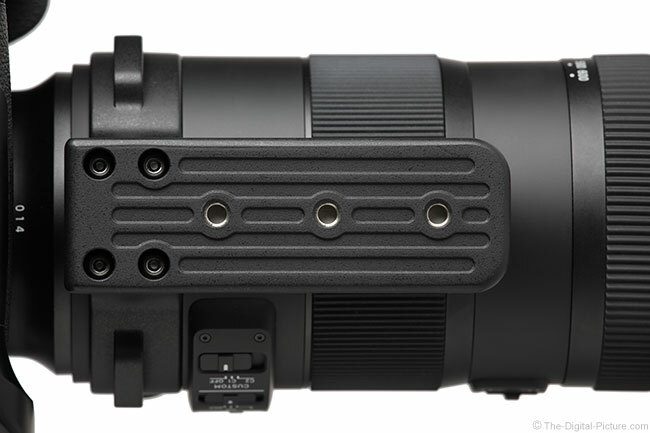 The Sigma 150-600mm Sports Lens qualifies for Sigma's Mount Conversion Service in case you change your mind. My standard disclaimer: There are potential issues with third party lenses. Since Sigma reverse engineers (vs. licenses) manufacturer AF algorithms, there is always the possibility that a DSLR body might not support a (likely older) third party lens. Sometimes a lens can be made compatible by the manufacturer, sometimes not. There is also the risk of a problem that results in the lens and body manufacturers directing blame at each other. Compatibility with the Sigma USB Dock is risk reducing as Sigma can release firmware updates for dock-compatible lenses. Sigma USA's 4-year warranty is superior to Canon's standard 1 year warranty (Sigma's international warranty is also 1 year). Two of the reviewed lenses were retail models and the third was on loan from Sigma USA. The 150-500mm f/5-6.3 DG OS HSM Lens was Sigma's prior entry into this lens class. Comparing the Sigma 150-600 Sports to the Sigma 150-500 OS shows the new lens having a very strong advantage at the long end. I would rather have any of the 150-600mm lenses over this earlier model. Sigma produces one of this lens' strongest competitors, the nearly 50% lower-priced and much lighter Sigma 150-600mm f/5-6.3 DG OS HSM Contemporary Lens. The Sigma 150-600 Sports vs. 150-600mm Contemporary lens comparison is an interesting one. I expected the "S" version to be vastly superior optically, but that is not completely how the results turned out. In fact, at first glance at the image quality results, these two lenses may appear to share the same optical construction, but a look at the internals shows the elements and groups counts being different. The max aperture step-down, as shared in the table early in this review, is also different with the "C" having a slight advantage. Looking at the wide open aperture image quality results, I see the "C" lens having a very slight advantage in the center of the frame at wider than 300mm focal lengths and at 300mm, the "C" wins more noticeably overall. At 400mm, the two are very similar with the "C" having a slight edge in the corners. The differences at 500mm are not going to show in real life images. At 600mm, the most important focal length for a significant percentage of the target market for this lens, the "S" has an edge. Stop down to f/8 and image sharpness across the entire focal length range isn't a factor in this lens selection decision. The Sports lens has slightly less distortion and slightly more flare overall. I can tell you from many hours of use of both lenses, the Sports model is built for professional use and the Contemporary model is the much more comfortable handheld choice. 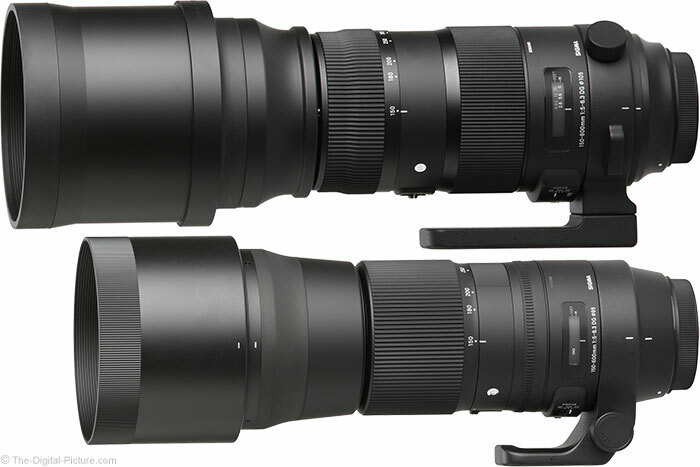 Another key comparison to make is the Sigma 150-600 Sports compared to Tamron 150-600 VC Lens, the first major entry into the 150-600mm lens category. Until 300mm, these two lenses are very similar in sharpness. From 300-400mm, I see the Tamron having an edge. The Sigma has sharper corners at 500mm and I would rather have either of the Sigma lenses when I need 600mm. The same lenses retain their sharpness advantage at f/8, but the advantages are slight except at 600mm where the Sigma rules. The Tamron has slightly stronger pincushion distortion and has stronger CA. I found the Sigma to more consistently focus accurately and to be handholdable at longer shutter speeds. The Sigma has a superior build quality, but it is also nearly 2x the price and significantly larger and heavier. The Tamron has a longer warranty (6 years vs. 4 in the USA). Another comparison that some will consider relevant is the Sigma 150-600 Sports compared to the Canon 100-400mm L IS II Lens. The Canon is lacking a significant 200mm on the long end, but this lens is Canon's longest small-form-factor zoom and it is a very impressive performer. The Canon easily bests the Sigma in sharpness and contrast over the entire shared native focal length range. Add a 1.4x to get the Canon up to 560mm and the two lenses have similar image sharpness. The extended Canon lens has a narrower max aperture at 560mm (f/8.0 vs. f/6.3), but the Canon has wider native apertures than the Sigma has. The Canon has a significantly higher MM (0.31x vs. 0.20x). The two lenses are similarly priced (without an extender factored in), with the Canon having a smaller size and lighter weight. 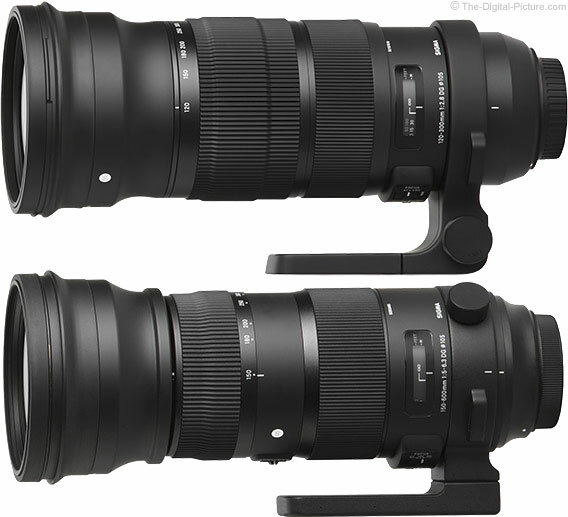 Another comparison I looked at is the Sigma 150-600 Sports compared to the Canon 200-400mm L IS Lens. 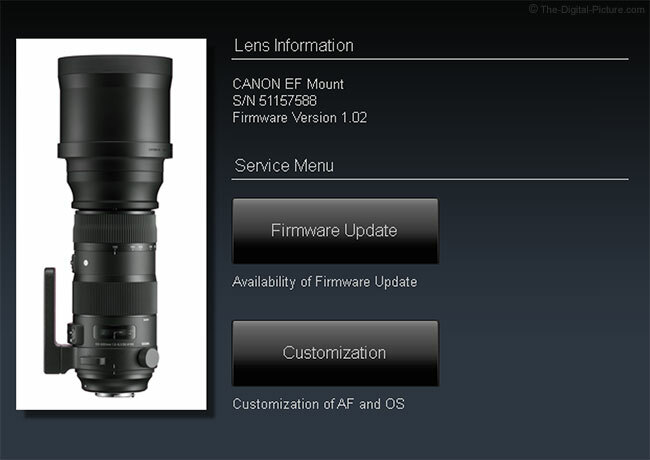 The Canon lens is very considerably more expensive, 27% heavier and noticeably larger. The Canon has a wider aperture and easily wins the sharpness comparison including at 560mm with its built in extender in the optical path. Use the site's various tools to make your own comparisons, including with the many lenses I did not specifically include here. Sigma 150-600mm f/5-6.3 DG OS HSM Sports Lens sets the bar high for build quality, performance and for range of features among the 150-600mm lenses available at review time. With optical performance just a bit shy of the most elite zoom lenses, and with an incredible range of very long focal lengths available, sports and especially wildlife photographers along with many others will find this lens to be a very useful tool in their kits. This lens can bring home imagery that many others cannot. * Buy Now - $200.00 rebate available from ?